Archie Comics’ Chilling Adventures Of Sabrina is a fascinating take on Sabrina The Teenage Witch that draws influence from classic horror comics and films to create an extremely dark interpretation of the title character and her world. Writer Roberto Aguirre-Sacasa and artist Robert Hack have successfully placed Sabrina at the center of a gruesome, very creepy narrative that explores the ugly side of witchcraft, but unfortunately the series has suffered from some major delays. It’s been nearly a year since the last issue came out, but this week finally sees the release of Chilling Adventures Of Sabrina #7, with #8 currently scheduled for the following month. Issue #7 spotlights Sabrina’s wicked father, Edward Spellman, who has possessed the body of her love interest, Harvey Kinkle, and is feasting on Harvey’s father while his mother is forced to watch in terror. 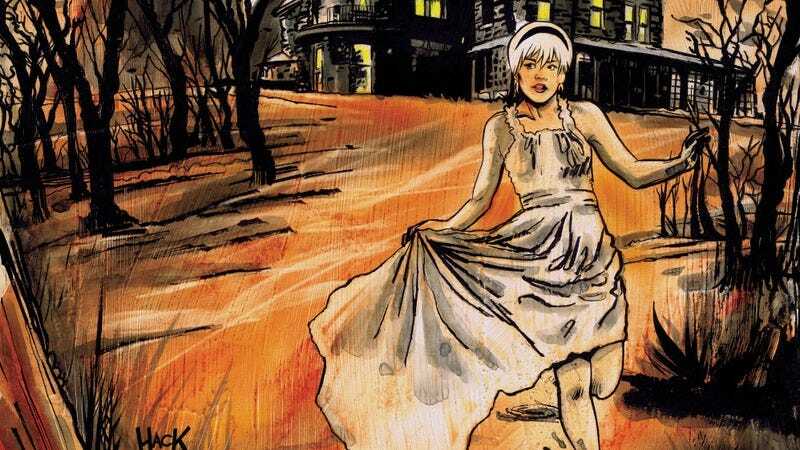 This exclusive preview of Chilling Adventures Of Sabrina #7 establishes the disturbing situation inside the Kinkle household before jumping back in time to explore Edward’s history, which features a reference to The Munsters in young Edward’s appearance and a shout-out to Rosemary’s Baby. Hack’s detailed linework and textured, weathered painting amplify the horror elements in the script, and while the delays between issues have affected the book’s momentum, it takes a lot of time to deliver artwork of this caliber. (Aguirre-Sacasa’s role as the showrunner of The CW’s Riverdale series has also taken a significant toll on the book’s schedule.) The A.V. Club also has a first look at pages from next month’s issue #8, which checks back in with Sabrina and brings some familiar Archie faces like Jughead Jones into the mix. Readers can jump onto this twisted new take on Sabrina and friends by grabbing issue #7 this Wednesday, and if they want to check out the start of this tale, the first collection is currently available.